Spring catches average 8-30 fish per day in the 3 to 15lb range. Action can be fast with limit catches common. Summer and Fall catches average 3-12 fish per day in the 5 to 35lb range. Book your charter to the fish type you desire and the type of action your group is looking for. 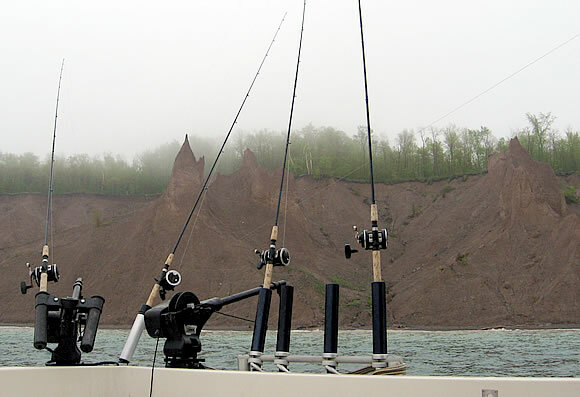 April: Close to shore fishing for Brown Trout and Coho Salmon, also offshore Lake Trout fishery. May: Close to shore Brown Trout & offshore Rainbow Trout fishing. June: Offshore Brown Trout & Rainbow fishing. July: Offshore Brown Trout & Lake Trout fishing. Salmon are starting to show up. 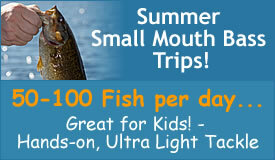 Also outstanding Small-mouth Bass fishing. August: Offshore fishing for Chinook Salmon & Lake Trout usually 5-10 miles offshore. September - October: Inshore fishing for Chinook Salmon getting ready to make their spawning run. Also offshore Lake Trout fishing.